What Is Shut Down Creech? UPDATE: Our beautiful, weeklong peaceful convergence in the Nevada Desert is almost here! We can't wait to see you all, and work together to GROUND the DRONES! Please register HERE, so we can best serve everyone. This is a special year because it marks the 10th anniversary of Bay Area CODEPINK's twice yearly resistance to killer drones at Creech Air Force Base. It is also marks the 5th annual national mobilization known as "SHUT DOWN CREECH." Help us make this push for peace exceptional! Be there! Special theme: In solidarity with the national call to action to protest the 70th anniversary of NATO Summit in Washington DC, we will devote one day at Creech promoting: "ABOLISH NATO, DE-MILITARIZE NOW!" Please come for part or all of this amazing Peace Convergence to nonviolently resist the illegal U.S. drone targeted assassination program. Stay at the newly relocated CAMP JUSTICE peace encampment, set up on the "Goddess Temple" grounds, 3 miles from Creech AFB. Most meals provided. We will send you a transportation form after you register with us, to coordinate ride shares to/from Camp Justice & Las Vegas. Click on tabs at the top of this page for detailed info about: Housing, Transportation, Camp Justice, Meals, Sponsorship, Registration, etc. - 5th Annual Shut Down Creech, SPRING ACTION. 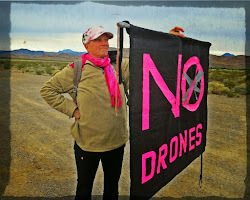 We now organize two Shut Down Creech weeklong anti-drone mobilizations every year, spring and fall. We will promote a bigger mobilization for the Fall Action (September 29 - October 5) because the weather tends to be more welcoming in the fall, but we highly encourage all to join us this spring as well. The Nevada high desert is beautiful in the spring, with snow on the mountains, and spring flowers blossoming. An added bonus, is that a smaller group offers more opportunities for bonding with each other, creating our "peace community" and forming a more cohesive peaceful resistance. - CAMP JUSTICE has recently moved to the "Goddess Temple." The Goddess Temple (also called "Temple of Goddess Spirituality") is located 3 miles north on highway 95, from where we vigil daily at Creech. This welcoming oasis offers us shade trees, running water, showers, cooking facilities and much more. The Peace Pavilion provides a perfect outdoor meeting place, and our sacred "Goddess Temple to Sekhmet" offers a unique place to seek solace, and for healing, prayer and meditation. Guest House beds are very limited. Beds available first for those most in need: our elders (70 & over) and those with physical limitations that make camping difficult. Early reservations encouraged. "Bed wait list" for others. Info on Camping, Guest House and other accommodation options. - Nonviolent civil resistance planned for Wednesday, April 3, with preparation & planning taking place on Mon. & Tues., April 1 & 2. Please look carefully at the week's scheduled program, as you plan your trip. But if you can only participate in a few days, we recommend Tues - Thurs, April 2-4. Peaceful vigils daily, Monday - Friday, April 1 - 5th, during rush hour commute times. 6:30 - 8:30 am and 3:30 - 5:30 pm. On Friday, there will only be a morning vigil, as we all depart at noon. Thousands of cars enter and exit at commute times, and we will stretch ourselves out along Highway 95 with large signs, banners and other visuals/props throughout the week. We are developing vigil themes that will vary each day and we welcome any creative ideas for themes or offerings of help to make visuals & props. .
A pledge to nonviolence guidelines and participation in nonviolence training, if needed, is required for full participation. Activists who can only participate in part of the week's activities are urged to arrive by the early evening on Monday, April 1, so we will all be together on Tuesday to make final preparations for a large peaceful civil resistance action on Wednesday. Creative and fun activities happen between the vigils and after dinner. These activities are optional, but give us time to rejuvenate ourselves and help foster a more connected peace community. They include informal walks in the beautiful desert, visits to see the "wild horses," trips to local hot springs, visits to nearby nature preserves and more. We also have informal presentations/workshops given by participants who have personal talents, experiences or expertise to share. If you have something special to offer, please contact us. Join us March 30 - April 5, 2019 at Creech Air Force Base, Indian Springs, Nevada for the Spring Action of the 5th national mobilization of nonviolent resistance to shut down killer drone operations in Afghanistan, Syria, Iraq, Pakistan,Yemen, Somalia, Libya and everywhere. Includes weeklong Camp Justice peace encampment. Thanks to excellent journalism, it has been revealed last year that there are over 900 drone pilots operating out of Creech Air Force Base. That means that there is a disturbing amount of remote murder on a daily basis happening at Creech alone. A recent military official reported in 2018 that over 80% of all U.S. air strikes involve U.S. drones, either for surveillance and targeting, and/or for direct strikes, and approximately 80% of all drone strikes go UNREPORTED. These are mostly strikes off any "battlefield," killing people as they are eating dinner in their homes, sleeping in their beds, driving their cars on the highway, worshipping in a mosque, attending a wedding parties or funerals....living their lives. Innumerable unarmed civilians, including women and children are being slaughtered by these cowardly weapons of destruction. This is unconscionable! Let's make the 5th annual SHUT DOWN CREECH a very powerful stance against the brutality of covert U.S. drone killing. Please join us, and help spread the word. We will organize together a large nonviolent civil resistance at Creech on Wednesday, April 3. People who aren't able to risk arrest are equally needed as support and as witnesses. Come one, come all. Together we are PEACE! In 2005, Creech Air Force Base secretly became the first U.S. base in the country to carry out illegal, remotely controlled assassinations using the MQ-1 Predator drones, and in 2006, the more advanced Reaper drones were added to its arsenal. Creech drone personnel sit behind computers in the desert north of Las Vegas and kill "suspects" thousands of miles away. The more primitive Predators have been mostly phased out. Independent research indicates that the identity of only one out of 28 victims of U.S. drone strikes is known beforehand. Though officials deny it, the majority killed by drones are unknown civilians. Since 2009 dozens of activists have been arrested for allegedly trespassing at Creech, while attempting to peacefully interrupt the indiscriminate killing and burning of innocent people by drones. The US drone program is rapidly proliferating as air bases are being converted to drone bases across the U.S. and abroad, but Creech remains a key drone base in U.S. state-sponsored global terrorism. Creech is where the killer drone program started--it is where we shall end it. We must put an end to the dehumanization of lives from Ferguson to Palestine to Syria and Yemen. We must close all foreign U.S. military bases. 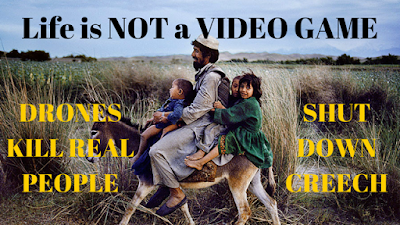 Money should be prioritized for human needs, not war profiteering. We must put an end to drone murder, drone surveillance and global militarization. Shut Down Creech! is a national mobilization of nonviolent resistance to shut down killer drone operations in Afghanistan, Pakistan,Yemen, Somalia, and everywhere.